From the foundation of God’s relationship with His people, the purpose of Maggie, as a child of God, and Maggie’s Music Ministry has been to bless others with the blessings she has received (Genesis 12:2). Maggie Lowe was born and raised in Mt. Airy, NC. As she loves to say, she started writing songs in middle school and good songs in high school. Since 2004 she has released five full length albums, a Christmas EP, and performed at coffee shops, street festivals, and various special events. In 2014, Maggie graduated from Appalachian State University with a B.S. in communication studies with a religious studies minor. In 2017 she earned a graduate certificate of completion in worship leadership through Grand Canyon University. She is currently working on a Biblical studies certificate through Gordon Conwell Theological Seminary which she will complete in 2018. 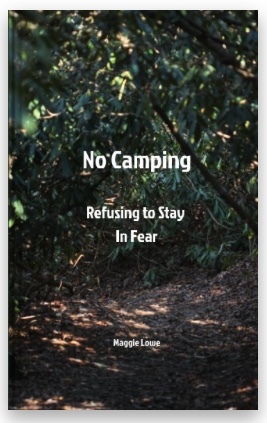 In 2017 she self-published her first book, No Camping: Refusing to Stay in Fear. The companion Bible study was released in early 2018 and the videos for the group lessons will be available before September of 2018. Maggie enjoys sharing her passions with groups whether it be through music or the spoken word. She is available for events and special Sunday services. Connect through the contact page if you are interested in booking her for you or your church.